A few new launches have caught my eye recently in a vast landscape of ‘more of the same.’ I haven’t tried either one, but I’m looking forward to checking out new innovations by two companies I’ve grown to really love. 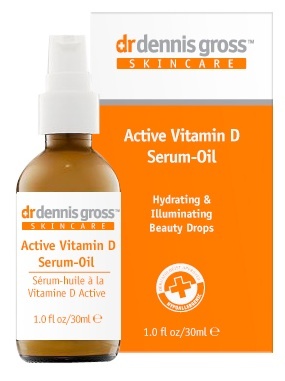 Dr. Dennis Gross Skincare has a new Vitamin D Serum Oil $65 for those of us who are so good with sunscreen that the sun’s own vitamins can’t penetrate to nourish the skin. I was way low on D years ago because I’m a crazed SPF weirdo and now take a vitamin D daily, but haven’t explored using it topically until seeing this serum. It’s formulated to be available to the skin without sunlight and they mixed it with Vitamins A, E, B, CoQ10, as well as Glycolic and Ferulic Acids to get some hydrating and brightening benefits in there as well. 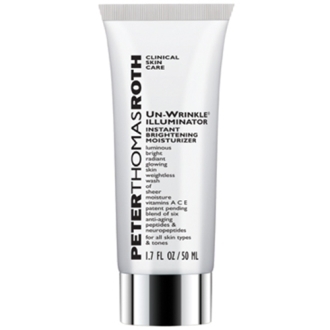 Peter Thomas Roth added a new addition to their way popular Un-Wrinkle line to hydrate and brighten up dull skin. Illuminator Instant Brightening Moisturizer $68 combines 3 color correcting shades of light pigment that blend with the skin to brighten dullness and neutralize redness. For me, the home-run is the combo of a wrinkle fighter with a skin perfecter – I love multi-tasking skincare that helps your skin to look great so you don’t need to use as much makeup in the end.